This obituary was found in Bolivar, NY, at the Bolivar-Richburg Area Genealogy section of the town library. I saw a copy which was tagged with the date 12 Mar 1897. Apparently it was the Bolivar Breeze newspaper in which it was originally published on that date. Friendship, Tuesday, Aged 91 Years. Mrs. Olive Thurber died at Friendship, Tuesday, March 9, aged 91 years. Mrs. [Thurber] was born November 10, 1806 and resided in Bolivar over sixty years. She moved to Friendship shortly after the oil excitement came and since resided with relatives in that town. She will be well remembered by all of the older residents. She leaves two daughters, Mrs. John Mix of Bolivar and Mrs. David Cole of Friendship, and one son, Richard Thurber of Bolivar. She was a pious woman who won and retained the respect of all who knew her. The funeral was held at Friendship yesterday. The second reference to Olive in the text of the obituary had the last name as “Thruber.” Since it was clearly a typo, I simply corrected it. Family tradition claims that OLIVE STREET in Bolivar, NY, was named after this beloved lady. I’ve found no evidence to verify that story, but I’ve driven on Olive Street dozens of times through the years, so I can at least verify the street is there with that name. I’d love to hear more if others know more. In the 1850 census, Olive Thurber is listed as born about 1806 “in Virgin Isles” and living in Bolivar. In the 1860 census, Olive Thurber is listed as born about 1809 “in Vermont” and living in Bolivar. In the 1870 census, Olive Thurber is listed as born about 1806 “in New York” and living in Bolivar. In the 1880 census, Olive Cowles is listed as born about 1806 “in Canada” and living at Friendship. The Cowles surname threw me for awhile, but I’ve noticed on some of the Ancestry.com family tree listings, done by various individuals, that Olive is referred to as Olive Richardson or Olive Cowles on a few trees (and Olive Richardson Cowles on one). 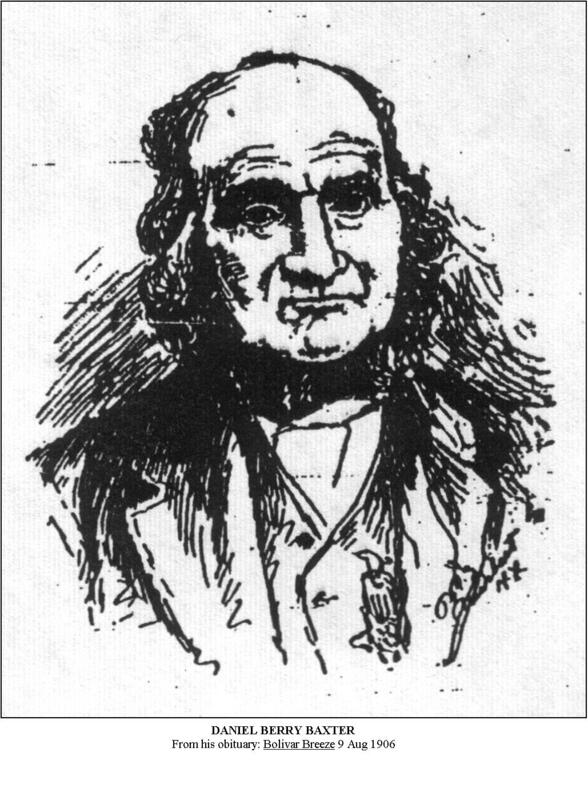 Many references list Olive’s husband as David Thurber, born 1805, but I have no evidence as proof. 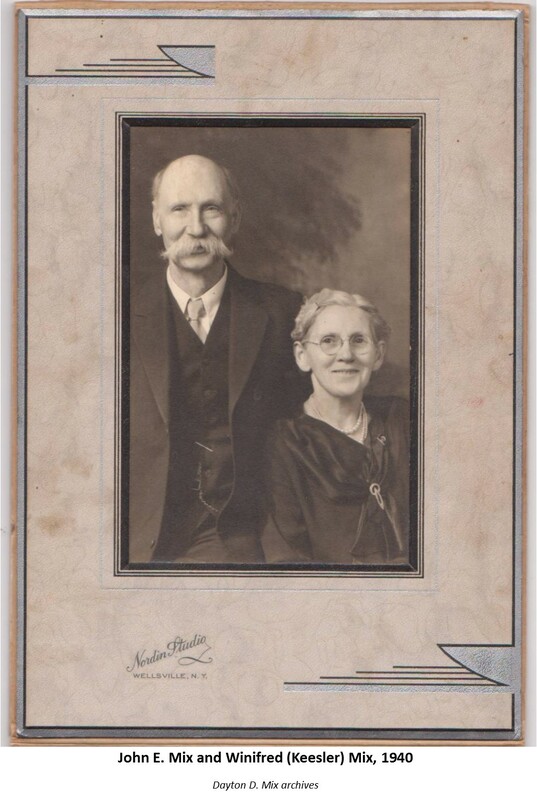 Today’s post is a picture of John Elmer Mix, my great-great-grandfather. He was born 150 years ago (28 Aug. 1864) and died 25 Jan. 1951. According to the note MY grandfather (John Dayton Mix) wrote on the original of this photo, it was taken in 1940. The woman with him was his second wife, Winifred (Keesler) Mix. John’s first wife, Mary (Knapp) Mix, died in 1932. He then married Winifred on 9 December 1934 in Wellsville, Allegany County, NY. MARRIED: (2nd) Julia A. Fairbank, 1849. Daniel was my mother’s great-great grandfather. We’re related to Daniel through his son, DeForest Abbott Baxter. Report from the RECORDS and PENSION OFFICE to the Commissioner of Pensions: 23 Jan 1894: “Daniel B. Baxter, Co. I, 27th Regt NY Inf. was enrolled Sept 20, 1861, and discharged Mar 19, 1863 on SCD. Again enr in Co. D, NY Engs Feb 29, 64 and MO [mustered out] June 13, 65. From enr. to dis. he held the rank of Pvt from enr 1864 to NW Pvt and during that period the rolls show him present except as follows: Feb 28, 63 sick in hosp Balt Md save to discharge. The medical records show him treated as follows: as David B. Baxter, Priv Co. I, 27 NY vols Jan 2-8, 63 GS [gunshot] wound, left hand; as Danl B. Baxter, Priv Co. A, Jan 9 to Mar 20, 63, vulnus sclopet, discharged from service Mar 20, 63. Nothing additional found.